The Republican nomination fight continues to be dominated by political newcomers Donald Trump and Ben Carson. In Iowa, Carson has moved up to tie Trump. In South Carolina and New Hampshire, there is Donald Trump with a large lead, and then there is everyone else. 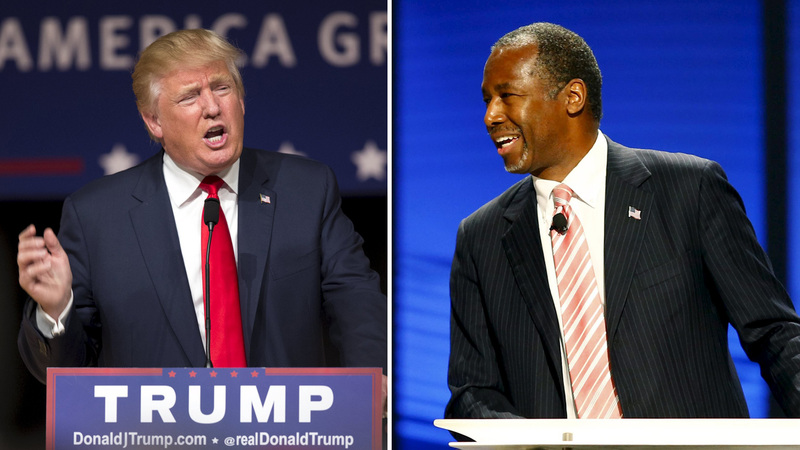 It's not simply that Trump - or Trump and Carson - are heading a fractured field. It's that so many of the candidates in the race aren't viewed as satisfactory choices so far. In Jeb Bush's case, not only is he trailing and mired in single digits, but more than half of Republicans would be dissatisfied with him as the nominee. Bush, Christie and Paul elicit similar satisfaction in Iowa and South Carolina, suggesting all those candidates have a great deal of work to do turning around perceptions in the next three months. Trump remains very polarizing on this measure. Although he tops the polls in all three states, majorities of those supporting other candidates in Iowa and New Hampshire - and 41 percent in South Carolina - would not be satisfied with him if he eventually wins the GOP nomination. In New Hampshire, Carly Fiorina is roughly split in this regard, with her non-supporters about even on whether they'd be satisfied with her nomination or not. Slightly more in Iowa and South Carolina would be satisfied with her as the nominee. In all three states, Ben Carson would satisfy the largest percent of GOP voters as their nominee, even if they aren't currently voting for him. In September, Trump had a small lead over Ben Carson. Now, the two candidates are running even. Ben Carson has drawn more support among white evangelicals - who always make up a sizeable portion of caucus-goers there (34 percent, vs. 17 percent for Trump). Trump has lost ground among this group since last month. Carson is also beating Trump among Iowa conservatives. Trump leads Carson among men; Carson leads among women. Trump also leads among seniors. Trump's support in New Hampshire is about the same as it was a month ago. In South Carolina, Trump has a large lead as well. The study shows a bit of the populism driving GOP politics now, too: Republican voters in all three states are likely to say the party isn't paying enough attention to the middle class. Voters are more likely to say the party is paying too much attention to its large donors and to the wealthy. Donald Trump's backers are strongly likely to voice this complaint. At least six in ten in New Hampshire and Iowa want the party to pay more attention to the middle class. Most of Trump's voters - and most of Carson's - in South Carolina think the party is paying too much attention to donors. Although Trump has gotten a lot of attention for his call to build a wall along the border, that isn't the top priority for Republicans when given a list of policy priorities. Asked what one thing they'd most like a Republican president to do, a balanced budget and repeal of Obamacare top a varied list in all three states -- which suggests that amid the party's divisions and frustration with Washington that polls have shown, many of the policy preferences that propelled Republicans to their Congressional majorities are, at least partially, still in place. A full description of the poll methodology is here.